Burbank, CA – Celebrating its 14th year, the Martial Arts History Museum’s presentation of the Dragonfest Expo last week, was a huge success. Dubbed as the “comic con for the martial arts,” Dragonfest brought in nearly 3,000 spectators from across the globe and crowded the Pickwick Gardens Convention Center in Burbank to its capacity. 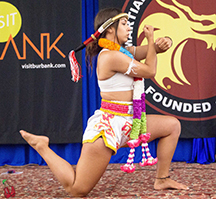 Dragonfest, considered the biggest martial arts convention in the world, returned to the city of Burbank this year with many rave reviews. “My wife and I are from Germany and we just got married and decided to make Dragonfest our first honeymoon stop,” notes a newlywed couple from Germany. “This was without a doubt, the most successful convention we have ever had,” notes museum president Michael Matsuda. Dragonfest was not only filled with nearly 150 vendor booths, but a variety of cultural performances were enjoyed by the crowd. From Thailand cultural dance movements, Filipino stick dancing, taiko drumming, Chinese face changing to martial arts demonstrations and even a star wars light saber battle. Among the celebrities were Joe Mantegna, Michael Jai White, Phil Morris, James Lew, Paul Wee, Don Wilson, Eric Roberts and dozens more. The event was topped off by a second day of actual, hands-on workouts with the likes of such greats as Benny “the jet” Urquidez, Don “the dragon” Wilson, Leo Fong, Felix Roiles, Lu Feng, Michelle Manu, Sifu Matthew, Vince Cecere, Robert Redfeather and Dr. Kam Yuen. Sponsors this year included http://www.VisitBurbank.com and Dr. Kam Yuen of http://www.Yuenmethod.com . Additional sponsors were Kathryn Barger, L.A. County Supervisor, Leo Fong, JS Films and Martial Arts Entertainment. Plans for next’s years Dragonfest will include an additional, third day for all to enjoy. For info on Dragonfest, visit their site at http://www.Dragonfest.com. For info on the Martial Arts History Museum, visit http://www.mamuseum.com or come by the museum at 2319 W. Magnolia Blvd., Burbank, CA 91506.